“My droplet of fate reflects the Jewish ocean,” wrote Béla Pásztor in his autobiography. Indeed, his life and career epitomized the experience of an entire generation of talented Jewish Hungarian theater directors, filmmakers, writers and artists. This film and theater cultural history spans Hungary, Israel and Germany. to an artistic career representative of its era. 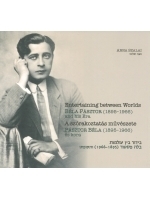 The intended audience of this trilingual cultural history film and theater book is students, educators and general readers interested in twentieth century film and theater history, in Central-European artistic careers in the shadow of the two World Wars, and those working at archives, libraries and museums. It is for English, Hungarian and Hebrew language readers curious to learn more about the difficulties and dangers overcome by resilient creativity and innovation. Béla Pásztor’s story is a valuable historical record. His life and accomplishments were shaped by and reflected the momentous currents that directed the precarious path of Hungarian – indeed, much of Central European – Jewry in the first half of the Twentieth Century. He was at the forefront of experiencing, affecting and chronicling the transformational events of his time and his people. When Hungary was struggling to become a modern nation at the beginning of the century, when it later became increasingly anti-Semitic and ultimately Nazicollaborationist; when many Jews migrated to and nurtured the new State of Israel after the Holocaust; when Berlin became the focal point of the Cold War; and during other important historical turning points – Béla Pásztor’ was intimately present and meaningfully impactful.